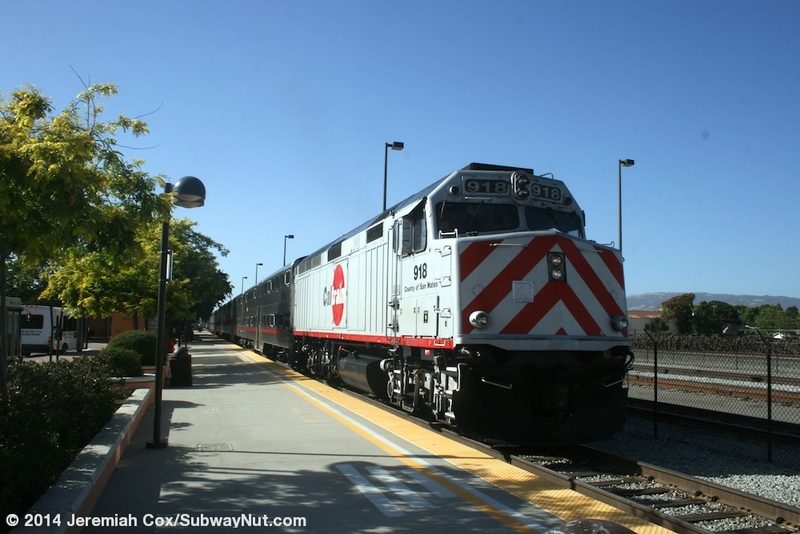 Gilroy is the southern terminus of Caltrain but receives service from just three trains per weekday peak direction rush hour (stored overnight at the station) that run south of Tamien. Two trains per rush hour peak direction were extended south along what was then the Southern Pacific Railroad beginning on July 1, 1992. Service was increased to four rush hour round-trips per day on February 7, 1994 but decreased back to 3 round-trips trains per day with the August 1, 2005 schedule change to have an extra trainset for more service on the main corridor. This amount of service continues to today. Weekend service was experimented with once for a three-month trial period between November 18, 2000 and February 25, 2001. 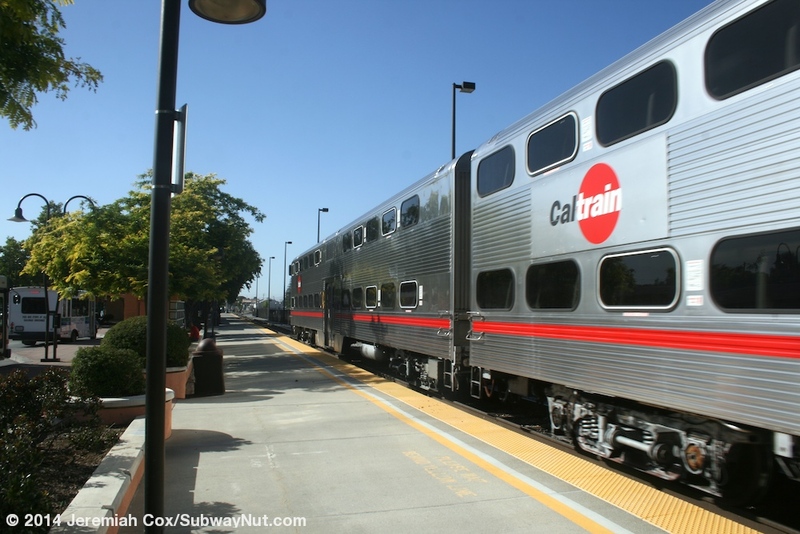 For these three months 2 round-trips per day, one AM round trip, one PM were extended south from San Jose to Gilroy. 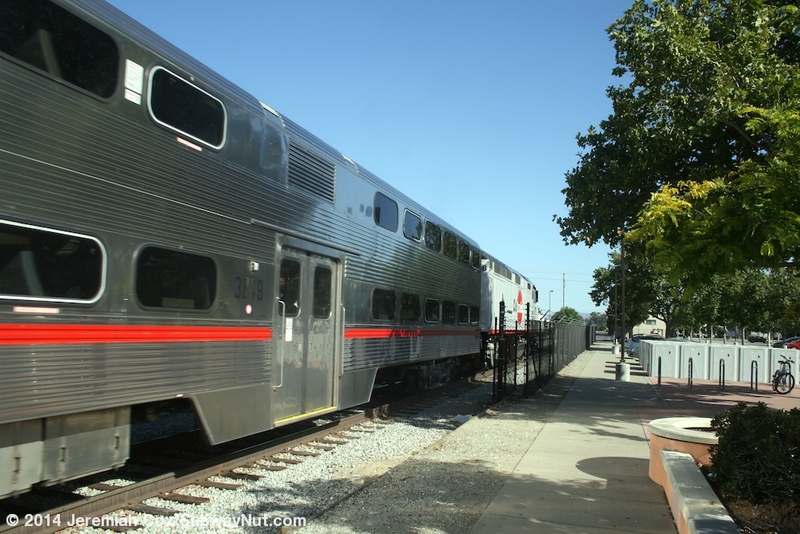 These trips were designed for leisure travelers both from Gilroy to make day trips to San Jose and San Francisco and for car free day trips to Gilroy. 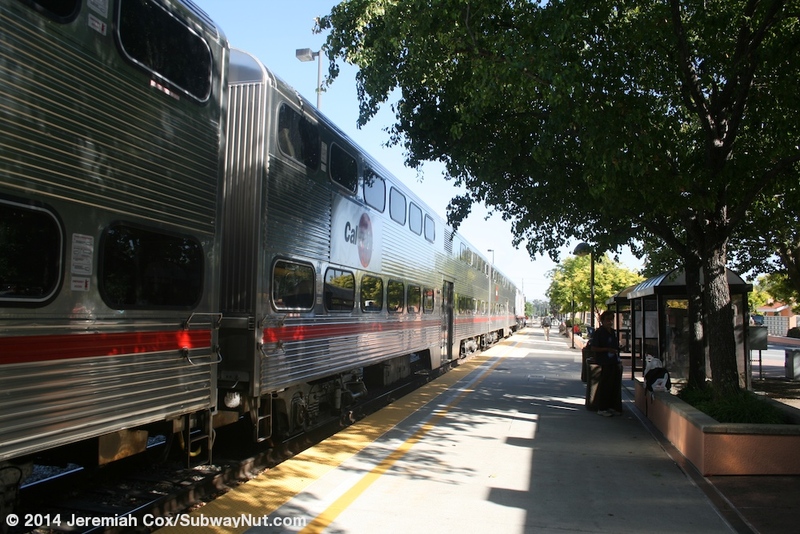 A connecting shuttle service connected the Gilroy station to attractions outside of downtown. Ridership goals didn't materialize (The average Saturday ridership was 60 passengers per train compared with a goal of 150; the average Sunday ridership was 31 per train and the goal was 100.) and weekend service ended after the trial period. The other times special weekend trips to Gilroy, the garlic capital of the world, have operated is to its annual Garlic Festival. These operated in the 1990s until the 2000 or 2001 festival. The station is the southern terminus of VTA Local Bus Route 68 that runs between Gilroy and San Jose Diridon with 3 buses per hour or better during weekdays, half-hourly on weekends so there are public transit travel options when Caltrain isn't running (this bus route facilitated your webmasters some evening return from Gilroy during his visit). 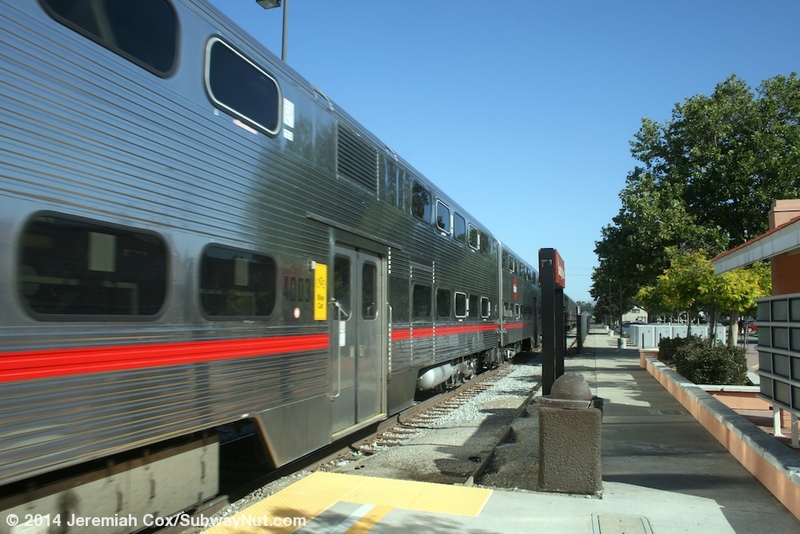 The bus though is scheduled to take an hour and 45-50 minutes over double the travel time of Caltrain's 50 minutes between Gilroy and San Jose. 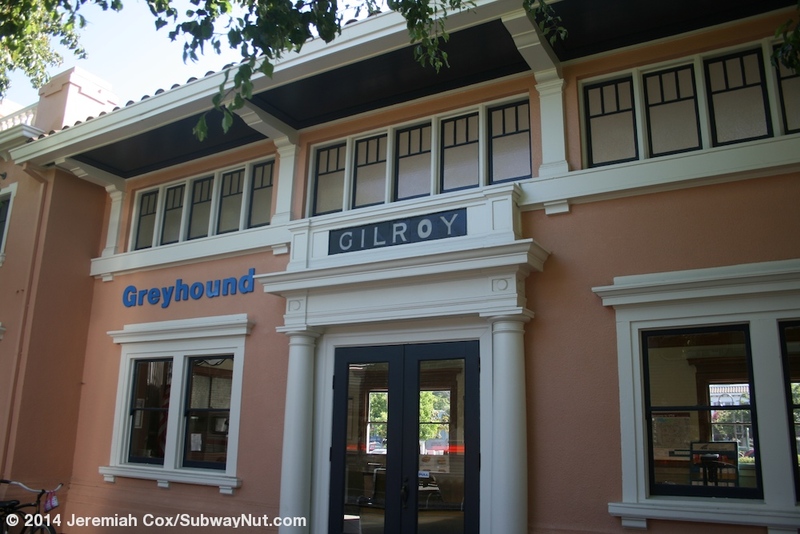 The station is located at the Gilroy Transportation Center. The historic SP depot built in the Italian Renaissance style and opened in 1918 is the centerpiece of this station. The depot was closed in 1971 when all passenger train service was discontinued with the formation of Amtrak (the Coast Starlight has always passed through Gilroy but never stopped). 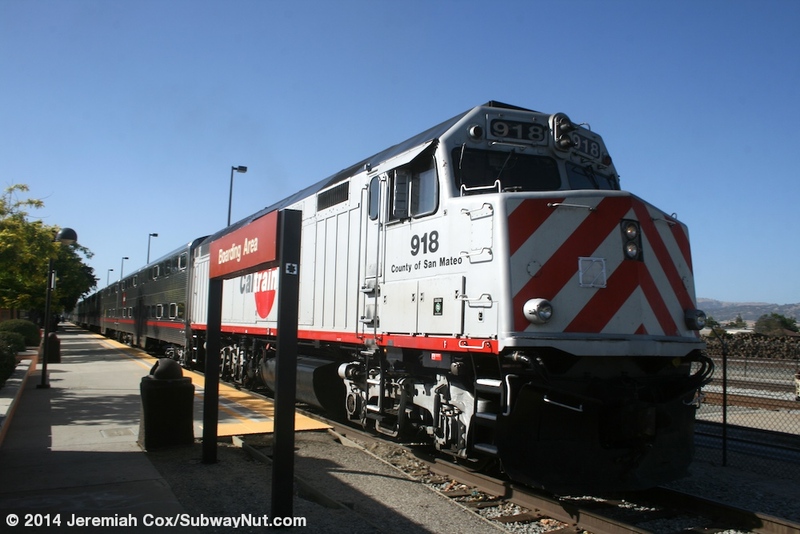 The SP Del Monte a local train from San Francisco to Monterey and Pacific Grove was the last train to stop in Gilory before Caltrain and was discontinued on April 30, 1971 the last day before Amtrak began. The station has the historic black paint and chalk train departure board that still includes this trip. 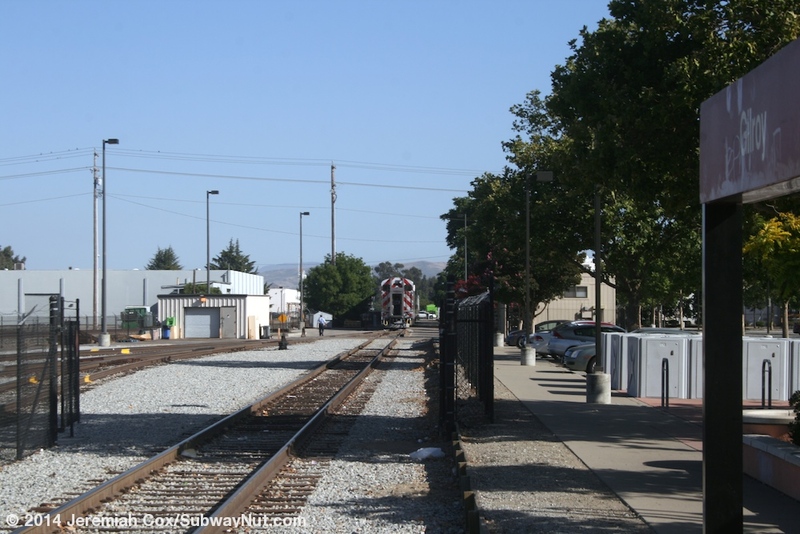 Although the Amtrak Coast Starlight bypasses the station (and a new platform would be required to allow it to stop, or switch into the yard), Gilroy is a Thruway Bus Stop (Amtrak code GLY) because Monterrey-Salinas Transit Express Route 55, the Monterey Express is also an Amtrak Thurway connection. One southbound Coastal Bus (running from San Jose to Santa Barbara) also gets off US-101 to stop at Gilroy, supplementing Route 55. 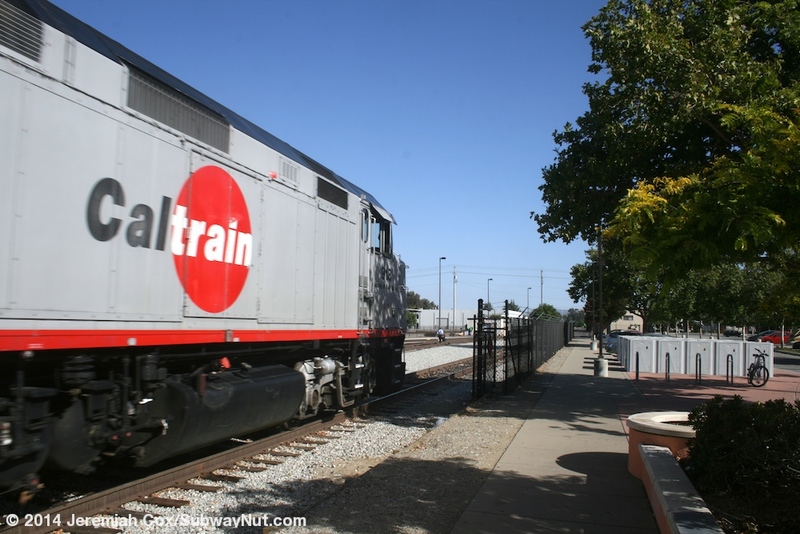 The various proposals for the Coast Daylight (a daytime train from Los Angeles directly to San Francisco running up Caltrain from Gilroy north, nearby begun in 2001) is proposed to stop in Gilroy that will require the platform situation at the station to be resolved. 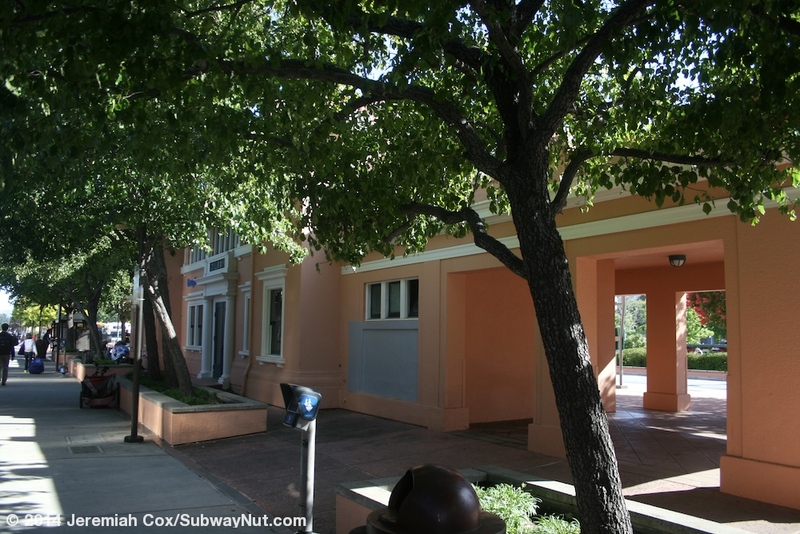 The pink single story depot was restored and reopened on December 2, 1998. 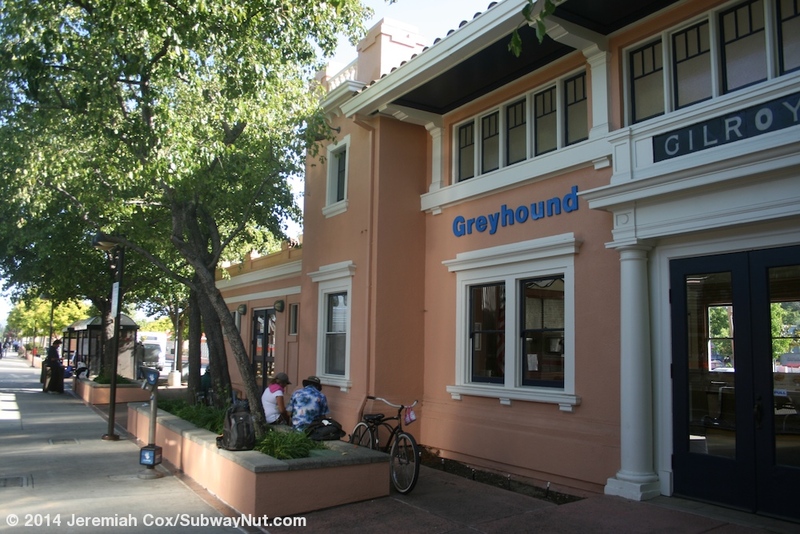 It is currently the Greyhound Station, there is also a snack shop attached. Inside is a nice large waiting room with a central wooden bench that looks a bit too modern more in the rep. The green paint and cherry molding has been restored but the Greyhound logo above the ticket office looks extremely out of place. There are also restrooms with a sign before them indicating that their for customers only. It isn't clear if Customers means Greyhound only includes bus and Caltrain riders also using the transit center. The depot is located directly on the west side in the middle of the station's single side platform that has a tactile warning strip. 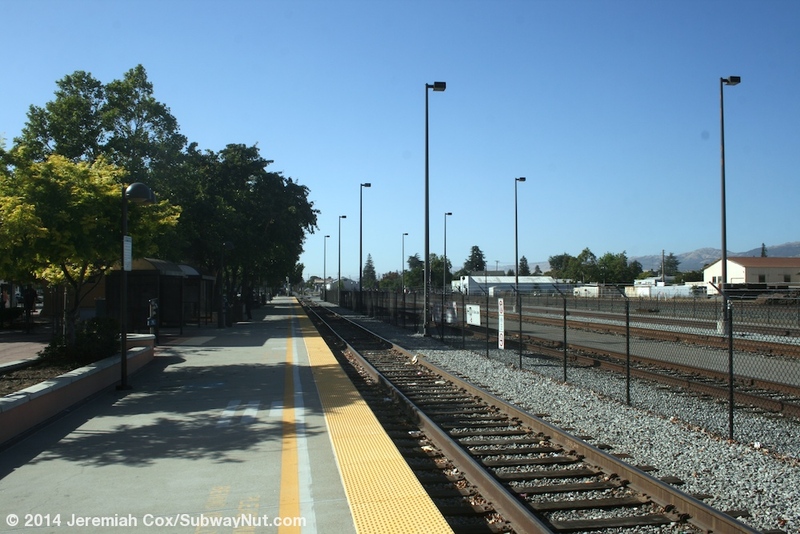 This platform begins at the grade crossing of 7th Street/Old Gilroy Street and extends south. The platform is along the easternmost of four tracks that switch off of the main line just before the station and switch back and become one drill track south of the station that ends in a bumper block never rejoining the main line. 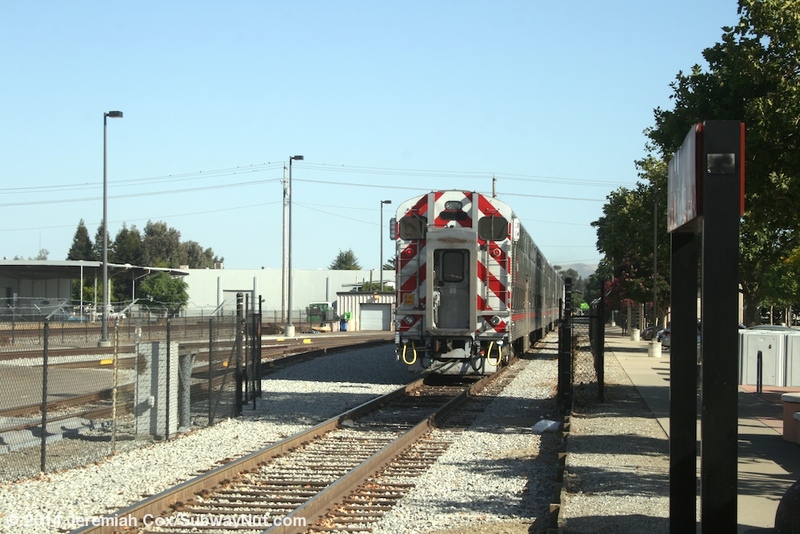 This means the Coast Starlight bypasses the station along the opposite edge of the train yard, not but doesn't actually bypass the station platform, and the current situation would require a back-up move for any train to stop and not terminate at the station. The yard's three tracks have a number of lampposts for nighttime yard operations and security. They are parallel to the platform are surrounded by a barbed wire fence. This fence extends south around the drill track south of the station with a gate for the platforming track at the southern end of the platform. In the evening, terminating trains discharge their passengers before the crews open the gate, run down the drill track (that keeps trains from blocking the main line entering the yard) and reverse direction to enter one of the three siding tracks. The move occurs in reverse the next weekday morning when originating trains go south down the drill track, through the normal gate opening in the fence and retrieve their passengers. 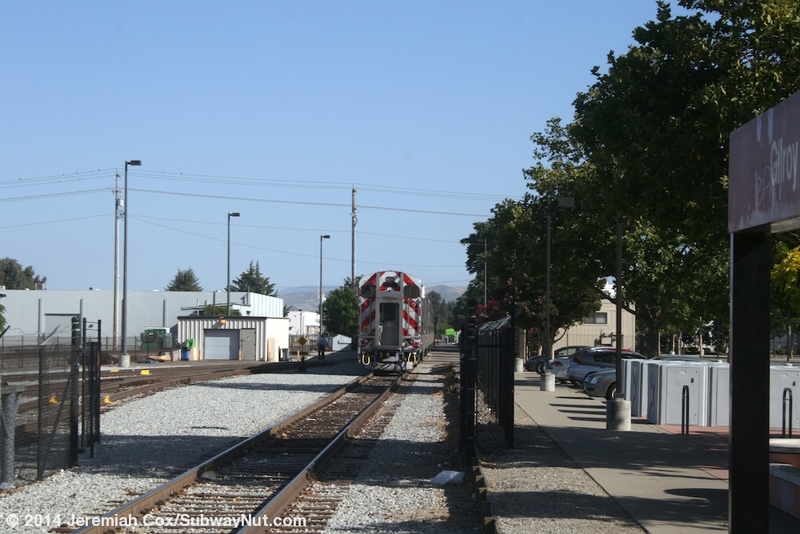 The three trainsets that overnight in Gilroy are all stored parallel to one another on the tracks parallel to the station platform. I assume between 1994 and 2005 when there was the forth train to Gilroy that terminated and laid up for the night it was kept on the drill track itself and had to be the first train in, last train out. 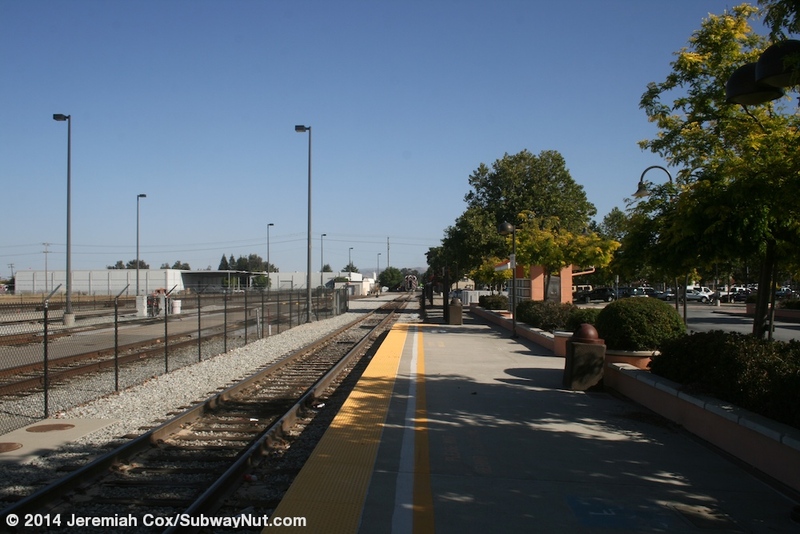 Along the middle of the platform is the already mentioned depot; just south of this is the bus loop of the Gilroy Transpotation Center. Buses include local route 68 to San Jose, 4 VTA Community Bus Routes (using Minibuses) that is the local Gilroy bus system and the terminus of two peak hours, peak direction only express bus routes. All VTA buses that stop at the Gilroy Transit Center terminate. These buses stop at one of 6-7 bus bays either along the platform (there are some planters between the bus stops and the platform) or at an island parallel to the platform. 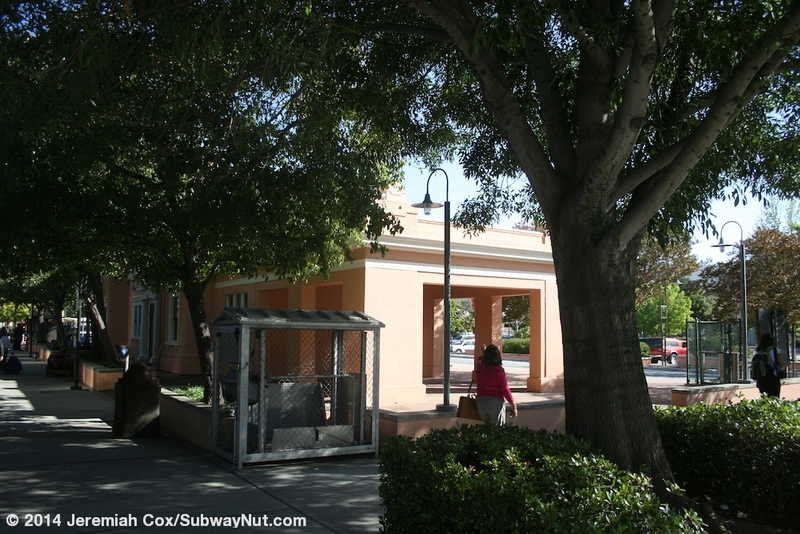 These each have two pink shelters that have benches and portions of windscreens around them. 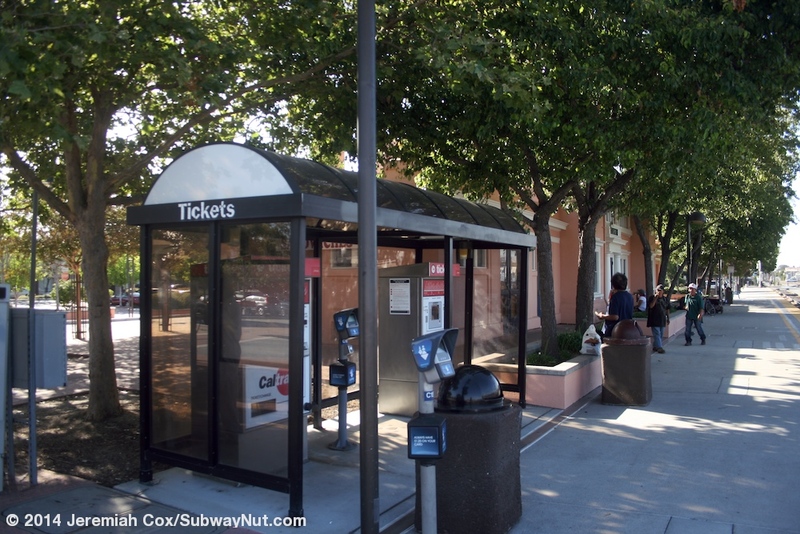 The intercity Monterey Transit, Amtrak Thruway Bus, and Greyhound stop directly street side of the depot. The signs for these buses include an old Pointless Arrow Amtrak sign. The rest of the station area is surrounded by a long and narrow parking lot with a total of 471 parking spaces. The parking lot is bounded by Monterrey Street parallel to the station and 7th Street at its northern end, ending across from the end of 9th Street (that is split by the train tracks) at its southern end. The station platform's amenities include a fenced off mobile-lift. 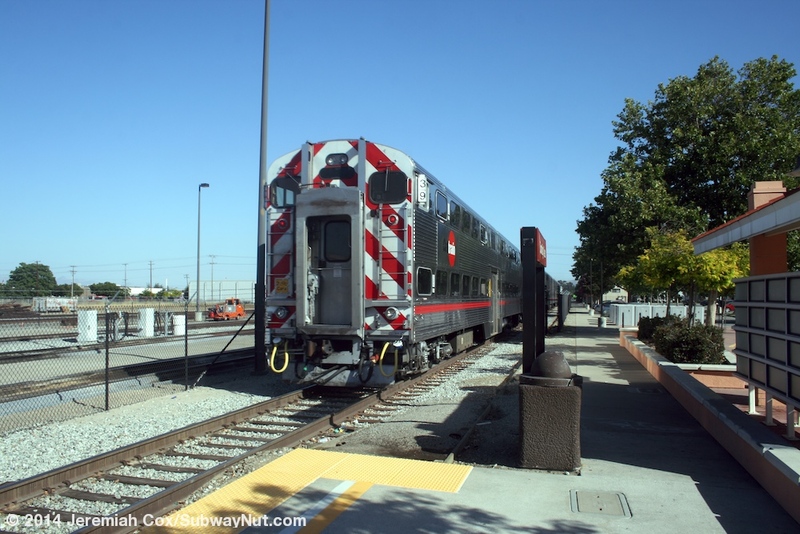 This was the way that the first wheelchair passengers used Caltrain when it became accessible to wheelchairs starting in 1995 (Gilroy was one of the original stations). Like at every Caltrain station there is a Blue Bench which is the designated waiting area for help boarding and lines up with the ADA car that on Galley Car trains an onboard lift. There are two black shelters on the platform; just south of the depot one covers the station's two TVMs, the other a bench. A few Compass Card Tap On/Tap Off Validators are also situated. 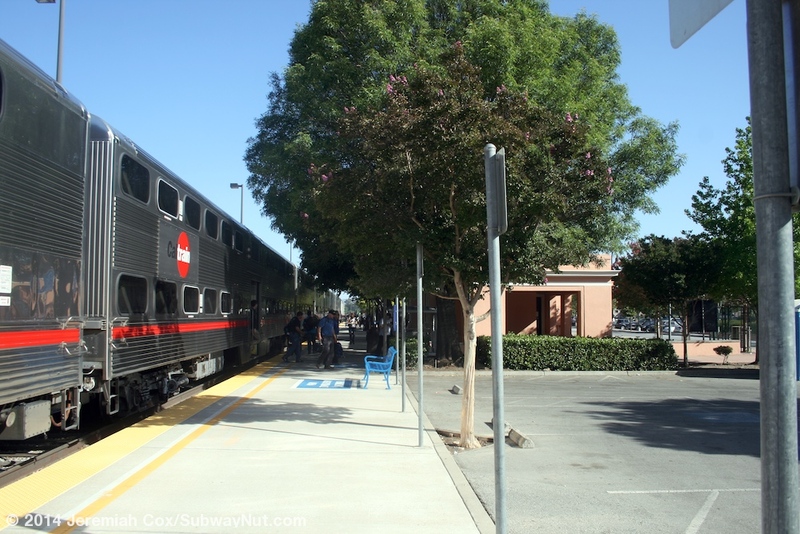 The only signage (except for Gilroy lettering on the depot itself) is red signs just beyond each end of the platform. These say Gilroy on one side and Boarding Area facing the street. 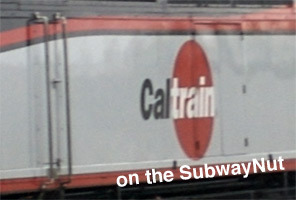 There is also an old CalTrain era logo Gilroy sign along 7 Street/Old Gilroy Street near the northern end of the platform. 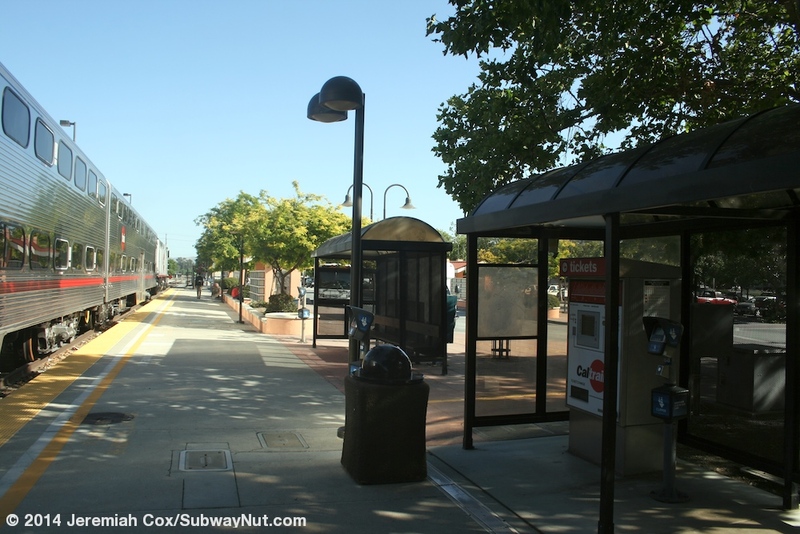 At the corner of Monterrey Road and 7th Street of the parking lot is a normal VTA transit center sign for Gilroy with logos for bus, train, car, and bike.